Centering® Healthcare Institute (CHI) is improving health by transforming care through Centering groups. It has developed and sustained the Centering model in more than 450 practice sites and in some of the largest health systems in the world. Leadership and collaboration are at the heart of their success. They have partnered with many dedicated individuals and organizations to build a future where group healthcare becomes the standard of care while creating a movement that is impacting outcomes, the patient experience, and provider satisfaction. For more information on CHI and the Centeringmodels of group care, visit www.centeringhealthcare.org. Centering is an innovative, evidence-based model of group care that is effectively addressing the complex social determinants of health. This paradigm shift is making an impact by bringing patients out of the exam room and into a comfortable group setting. Patients receive the highest quality of care and, as part of an ongoing group, form a supportive community where they develop skills and confidence to take control of their health. The Centering model combines health assessment, interactive learning and community building to deliver better health outcomes and better care experience for patients and their providers. 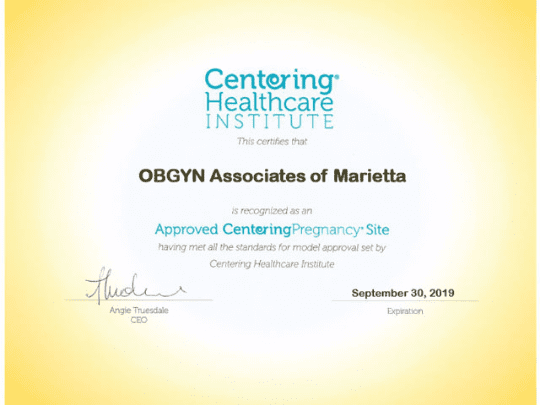 CenteringPregnancy group care follows the recommended schedule of ten prenatal visits, but each visit is 90 minutes to two hours long—giving women ten times as much time with their provider team. Moms engage in their care by taking their own weight and blood pressure, recording their own health data, and have private time with their provider for belly check.